In Ep. 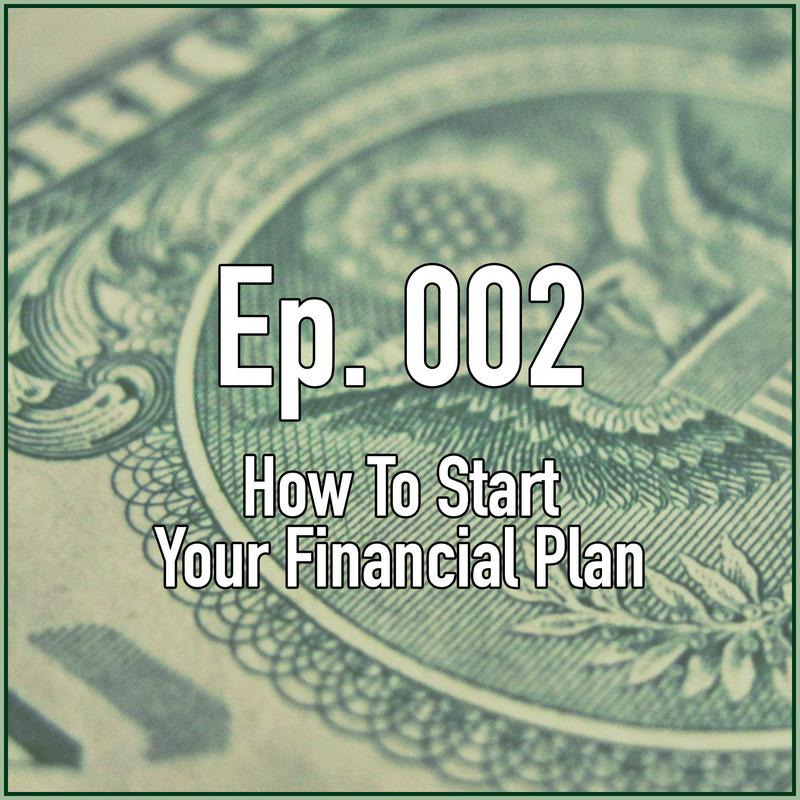 002 of Living With Money, Tim and Tom break down how to get your financial plan started. By analyzing your monthly cash flows and your monthly fixed and discretionary expenses, you can tell easily if you are running at a “profit” or a “loss”. By examining your own “personal balance sheet”, you can also tell if you own more than you owe. This is an important exercise for EVERY age, and this is a crucial first step in getting your financial life on the right track. Tim Mullooly: Welcome back to Living with Money. On today’s episode, we are going to dive into how to start your financial plan. Tom Mullooly: And since most people are procrastinators when it comes to financial planning, I’m going to procrastinate starting this episode with a little story, but you’ll see where it’s going. Tim Mullooly: It ties in. Tom Mullooly: It does. Years ago, I used to go to this doctor. I actually met him through Little League. Older guy. He was winding down his practice and preparing to retire. Never did blood work. Never did any kind of testing, nothing. I would go in, sit in the exam room and wait for 35 minutes. And then he’d come in and he’d want to talk about his new iPhone or something like that. And then he’d be asking, “Well how’re you feeling?” And you would eventually get to the pressing need or the problem that you have. And I think that’s part of the problem that a lot of financial planners bump up against, is that people come to see you when there’s a pressing need or a problem, instead of having some kind of baseline or experience. I was surprised because I hadn’t been working this way before. So I really liked the process of it. And in that process, I also learned some things about myself, including the fact that I have Type 2 Diabetes, which I did not know about. But all of a sudden, it started to help connect a lot of dots. So doing blood work and doing this kind of testing helps develop a baseline. And Tim, I think that’s kind of where we want to go. Tim Mullooly: It’s a really good place to start, and it’s a good analogy to use for people wondering where they should start in terms of financial planning. It’s really hard for a financial planner to diagnose the problem. Like Tom said, a lot of people come in with these pressing needs and they just want the solution right away. But it’s really hard to do that if you don’t have some sort of baseline reading or the healthy picture to backtrack to and use that as a base. Tom Mullooly: That’s so true because over the years, we’ve seen people come in and they want some kind of instant answer or quick fix on, “How do I fix this problem?” I’ve got this issue with taxes, or I owe this money, or I’ve got to get money somewhere. I’ve got to do this, that, or the other thing. Tim Mullooly: Exactly. One thing I do want to say is you might be listening to this and think, “This might not be for me. I don’t need to do that.” But this is an exercise for every single age, regardless of how old you are. Just because you’re 24 years old, fresh out of college, and you have no real assets in your name, that doesn’t mean that you don’t have to examine your monthly in-flows and out-flows in terms of cash coming in and out because otherwise you’re not going to know where you can save more money to one day get you those real assets. Tom Mullooly: And likewise, if you’re say 44, and you’re really starting to build assets, you’re thinking about paying for college. You’re trying to weigh what’s more important, paying for college or putting money away for retirement. These are big issues that we wrestle with, with our clients. Likewise, if you’re say 64, so we’ve talked about people who are 24, 44, 64. If you’re 64, and you’re retired or planning to retire, this is a very important time to be talking with your financial planners. Your planner can help keep you or get you and then keep you on the right track. So important. Tim Mullooly: It’s just as important for young people as it is older people. And you don’t want to skip any steps or think, “That doesn’t apply to me.” It’s always a good exercise to cover all of your bases and especially when you’re working with a financial planner, because they need to clearly understand your situation as best as possible before they can start making any changes. Tom Mullooly: It’s funny. Just thinking about that little analogy that I shared about the doctors. Doctors have a Hippocratic oath. It’s paraphrased. It’s boiled down to one line, first do no harm. Recommendations need to help, not hurt. It’s kind of like the discussion that we have with people talking about going on a diet, or I hate using the word budget, but it’s important to know your numbers. That is so critical to getting on the right track. People are really surprised at when they put the numbers down in writing or on a spreadsheet, where the money goes on a monthly basis. So Tim, I think this is a good place to really get down into the meat of this. Where should we start? Tim Mullooly: The best place to start, in my opinion, is with your cash flows. Sometimes when you say the words cash flow to people, their eyes kind of glaze over. But it’s very important. And the easiest place to start when you’re measuring your cash in-flow is your pay stub. Even if you direct deposit your paycheck every month or every couple weeks, however often you get paid, you still get a pay stub. And that’ll show your net and gross income. Understanding your pay stub is crucial. That’s a very important topic. We’re actually going to be covering that in a completely different episode, but for now, just looking at your pay stub is a great place to start when measuring your cash flows. Tom Mullooly: I think really just understanding where the money in your paycheck goes, really will help open a lot of eyes for folks. They start to see how much health care costs. How much money they’re paying towards taxes. What’s going on with their retirement account at work. All of these things are important, but you get the answers every two weeks or twice a month, right in your envelope. And take a look at it. We’ve gotten to the point in our society where folks just skim over this stuff because it shows up, the money shows up in the bank on pay day, and they just move on. What a mistake. Tim Mullooly: A lot of times when people start working at a company, they sit down with the HR rep within their first week, and they pick some sort of withholding for their taxes, federal and state some number, and then they just forget about it, and they never really check how much they’re contributing or withholding from their paychecks, and it says it on your pay stub every time you get paid. It’s always something to keep an eye on. When you’re working with a financial planner, they can easily identify from your pay stub whether you’re over withholding or under withholding, and that can make a significant change to your month-to-month numbers. Tom Mullooly: That’s one of the areas that we talk with our clients quite a bit, is examining what you’re having withheld from your paycheck every two weeks or twice a month, or every week. What’s being withheld for taxes. If you had some kind of lump sum event where you had a lot of taxes taken out of some kind of distribution, this may be an opportunity for you to reduce the amount of money that you have withheld in taxes. Why are you giving the government an interest-free loan for your money just to get it back in April? I know some people like getting money back in April, so they can take a trip next year, but you can plan this a little differently. It really is worth taking a look at these kind of things. In a future episode, we’re going to break down your paycheck and walk you through line-by-line what’s happening in that. Tim, what’s next? Tim Mullooly: After checking your pay stub and looking at your cash flows, next would be your fixed expenses. Tom Mullooly: So let’s … Just define what fixed expenses would be. Tom Mullooly: Do you need to have nine million channels? Tom Mullooly: In your cable package. Tim Mullooly: Some people say that they do. Whether they actually do or not is up to them, but what matters the most is that everything gets accounted for. You need to know where all of these fall on a month-to-month basis. Tom Mullooly: Let’s spend a few minutes talking about fixed expenses versus what might be discretionary. I think that needs a little more attention. Tim Mullooly: So for fixed expenses, like we were saying, mortgage and rent, and also you can account for car payments or car insurance. If you don’t have payments, you’re still going to be paying for insurance. Medical insurance, life or disability insurance, and also just savings in general. We’re not talking about the savings that might be coming directly out of your paycheck into your workplace retirement. So this is savings outside of work. Just extra money that you have that you like to put away each month. Tom Mullooly: Right. Sometimes we get into conversations with folks, and they talk about savings and they refer to what they have in their 401(k) plan at work or their deferred compensation plan at work, their retirement account as their savings, but that’s not really accurate, is it? Tim Mullooly: Those workplace retirement accounts, they’re for just that, retirement. They’re for a future event. These savings that we’re referring to in the fixed expenses’ category, fall under more of the emergency savings, emergency fund type of savings. Things that, money that you can access at the drop of a hat if something happens and you need a big sum of money to pay for a repair on your house, or you lose your job and you need that income to cushion you for a couple months until you can start having income come in again. Tom Mullooly: The problem that we see very often is that folks come in to have a financial planning meeting with us, and we see no safety net. If they’re hit with they have to replace the transmission on their Yukon XL, that’s $2700. It’s a big check to write. A lot of people don’t have that kind of spare change lying around. If they get sick, have to go to the emergency room, a lot of times these bills, even though your insurance may eventually cover it, you may have to write a pretty large check. And so, life gets very expensive and we need to have that kind of safety net. Before we can even talk about investing, we need to talk about having some kind of safety net. This all goes back to examining your cash flow. This is so, so important and it’s a topic, it’s a discussion that a lot of folks simply don’t have. That’s why we stress it and make it important when we’re starting with folks on financial planning. Tim Mullooly: And sometimes it’s an uncomfortable conversation to have because people get skittish when they talk about how much money they’re saving or spending, but it’s a very necessary conversation to have. So not only examining your cash flows from your pay stub coming in, your fixed expenses each month. We talked about it a little bit before, but there’s also discretionary expenses that you have each month. And that’s pretty much any expense that you don’t label as a fixed expense. So like we said before, things like a cell phone bill, cable or internet could fall under that as well. Gas to put in your car. Groceries at the food store. Tom Mullooly: Going out to dinner. Tim Mullooly: Exactly. Car repairs or pets. Gym memberships. Netflix subscriptions. Things that you pay for each month that you wouldn’t die if you didn’t have them. Tom Mullooly: Right. If your situation gets really dire, and you are unemployed, you need to make some cuts, you need to figure out what your fixed expenses are, it’s amazing the things that you can do without. And so, it’s important to recognize what’s a fixed expense. I need that car every month to get to work. I don’t necessarily need a Netflix account. And yeah, it may be 12 or 15 bucks a month. That stuff really starts to add up when you’ve got a lot of these things. I’d also like to just bring up the potential elephant in the room. When we talk to folks about having a safety net, too many times we’ve heard at the conference table, people will say, “That’s what our credit card is for. And we can tap into that. We’ve got a $10,000 line of credit that we can use with this credit card,” and if you could see the look on Tim’s face when I mention that, it’s cringe-worthy. Tim Mullooly: Yeah. These discretionary expenses, I mentioned it before. They’re kind of in a way negotiable with yourself. Like Tom said, if you need to cut back, you can. You can choose to cut costs at the food store, or buy less groceries, or car pool with someone and save on gas or cancel your gym membership and just go for a run outside. These discretionary expenses are things that you could potentially do without if you have to. Tom Mullooly: Tim, a question then. Where does child care fall? Is that a fixed expense? Is it a discretionary expense? Tim Mullooly: For a lot of people, I would say fixed. It depends on, everyone’s different. Everyone’s situation differs. If you’re a family that has two working parents and young kids, child care is essentially a fixed expense unless you have another family member or someone that can watch your kids on a day-to-day basis. Child care today isn’t cheap, so that is a pretty serious fixed expense for a lot of people. Tom Mullooly: Okay. I’m thinking about putting together some numbers when I sit down with my financial planner. I’m looking at last month’s expenses. Last month was Christmas. That only happens once a year, but I also happen to have a pretty expensive car. I had to get four new tires. And that just doesn’t happen all the time. How do I figure out my monthly numbers with those kind of one-off things happening? Tim Mullooly: The easiest way to find those numbers of your expenses would be on your monthly bank statements. To kind of counteract the one-off events that you’re referring to, I would suggest grabbing the last, anywhere from three to six months. As many bank statements as you can find. And you can start to find averages of these numbers and expenses, as opposed to one month, like you said, Christmas you might be spending more money during the holidays. Or car repairs were higher in February than they were in January. By grabbing a lot of these bank statements and finding averages of these numbers, it’s easier to come up with a more reasonable budget. We’ll use that word again. To live on or to bring to a financial planner. Tom Mullooly: Right. You may buy tires once every couple of years for your car. It’s an $800 or $1000 expense, but next summer it could be a water pump. It could be something like that, that’s going to … You’re going to need to lay out 800 or 1000 bucks on the spot to fix something with your car. If you were in a position where you could put 70 or 80 bucks away in a special account every month, then when that $800 bill falls out of the sky on your lap, you have some money. Tim Mullooly: Right. That speaks to the importance of that emergency fund that we were talking about before. Because people say, “Oh that was a one-time event. That was a one-time event.” But if you look at it, those one-time events happen more often than you think. It might not be the same one-time event, but there are big costs that pop up along the way. Like we said, life gets pretty expensive, so having that emergency fund is crucial. Tom Mullooly: I started over 20 years ago using Quicken as a tool to help me track where the expenses go, but you could do this with a notebook. You could do this with an Excel spreadsheet. You can do this very simply, but the more data you have, the better estimating you’re going to get at knowing what your costs are. At a minimum, like Tim said, you need to be looking at three to six months. It would be better if you had 12 months. It would be better if you had 60 months, five years, where you could look through all of the data and see the trends. Hey, this is going up a little faster than I expected. Or this expense hasn’t really changed. Hey, I don’t need that expense. Maybe we can make some tweaks here and there, and that’s where things really get smart, but you’ve got to be a little nerdy and know your numbers. That’s so, so important. So, we’ve gone through our monthly expenses. Now what do we do? What’s the next step? Tim Mullooly: The next thing that I would recommend doing is creating your own personal balance sheet. If you’ve studied any sort of business classes, businesses have balance sheets every month and every year. You should do the same thing for yourself. And that’s taking a look at short and long term assets versus liabilities. To normalize that a little bit for you, it’s things you own versus things you owe. Naturally, the goal is to own more than you owe. For young people who have just bought a home and they have a mortgage payment now, the things you owe might be a little bit upside down at first, until you build some equity in that home. But that gets into a conversation of good debt versus bad debt. Again, we’re going to cover that in another episode, but if you’re a young person with a new mortgage and the things you own are being outweighed by the things you owe, it might be okay. Just take that into account. Tom Mullooly: On the left side of the balance sheet, we talk about assets. That would be the net equity in your home. So that would be the value of your home. Which is priceless. And deduct the balance on your mortgage from that. And then any bank accounts, any money that you’ve got in the bank, any money that you’ve got squirreled away, investment accounts, any stock, mutual funds, things like that that you own. Start piling all of that up. That’s your asset side of the balance sheet. Tim Mullooly: And I would keep that rather broad. People can get very narrow down in terms of assets. You could price out how much your coach costs that you own in your house, or your TV. I mean, if you really want to get down and dirty with those numbers, you can, but I would keep it more as a broad level in terms of measuring your assets. Realistically, you’re probably not going to go out and pawn off your coach in order to pay the rent. Tim Mullooly: I would hope. Tom Mullooly: One of the questions that we get asked about when we’re putting together a balance sheet is where do you place life insurance on a balance sheet? And it may not actually belong on a balance sheet. If you have term life insurance, there really is no asset. That’s a cost that you have to pay every year to have the insurance. If you have whole life insurance, once you’ve owned it a few years, you’ll start to build up a small cash value. That actually is an asset, but it’s tricky because we get into conversations with folks and they’ll say, “Well we have a million dollars in life insurance.” Well, unfortunately, you don’t really get that money until you’re dead, so not really an asset. Tim Mullooly: So you kind of need to break down what is an asset and what isn’t. Put everything that is an asset on the left side of the page, and on the right side goes all of your liabilities, which I would recommend breaking down into short and long term liabilities, meaning anything that is payable within one year, I would classify as a short term liability. Anything greater than one year would be a long term liability. And if it is a long term liability, you should know how long it’s going to take for you to pay that off and what rate the interest is compounding because if you’re able to know those numbers, you’ll be able to better budget a way to pay it off, just knowing those variables going into it. Tom Mullooly: Right. That’s a short term liability. But the remaining four years left on the note would be considered a long term liability. What we’re trying to come up with, without getting too specific, is come up with these financial ratios to see how far under water you might be, and how important it is for you to have a safety net if you were to lose your source of cash flow. What do we have to address in terms of short term needs and longer term needs? So examining the liabilities, such an important part of financial planning. Tim Mullooly: Right. The balance sheet is a really nice way. It’s kind of like a snapshot of where you are currently. And you can use the balance sheet information to determine if you need to make any changes to the cash in-flows and out-flows that we were talking about earlier. It all works together to get you to any sort of changes that you might need to make to better your financial situation. Tom Mullooly: And we talk about, there’s an old maxim when it comes to financial planning, and that’s pay yourself first. So if you’re taking money each month and socking it away into a savings account, you’re building up that asset. So it really is a good tool to remember, to pay yourself first because that’s going to help you in the long run from falling into some money problems down the road. Tim Mullooly: We talked about the personal balance sheet and how businesses always have balance sheets. If you think about the cash flows and expenses that we were talking about earlier, I would consider that kind of a profit and loss statement for a business. And obviously, the goal there is to be running month-to-month, year-to-year at a profit, not a loss. If you are running at a loss, it can be easy for you to look at all the information that you have, all the expenses, and make changes to where you’re spending your money, to try and get you onto that profit side of the statement. Tom Mullooly: I think the real, one of the real messages or takeaways from today’s podcast has been you can’t know where you’re going if you don’t track where you are now, and track the progress from a certain point, and developing that baseline and then moving forward. Would you agree? Tim Mullooly: 100% agree. Once you have your monthly numbers in check, your balance sheet all lined up, you can start making some real progress on changing your financial life for the better. That is essentially the first place that I would start if you’re in financial trouble, or you’re looking to just have more money or be more comfortable with your money. Tom Mullooly: We want to help you become better prepared at Living with Money. Tim Mullooly: If you’re listening to this on iTunes, please subscribe to the podcast to get new episodes every week. And feel free to leave us a review or a comment, because it would really mean a lot to us. Thanks for listening to this episode of Living with Money. We’ll see you on the next one.